The Zachary Taylor Dollar honored the 12th President of the United States. The official circulation release date was November 19, 2009. 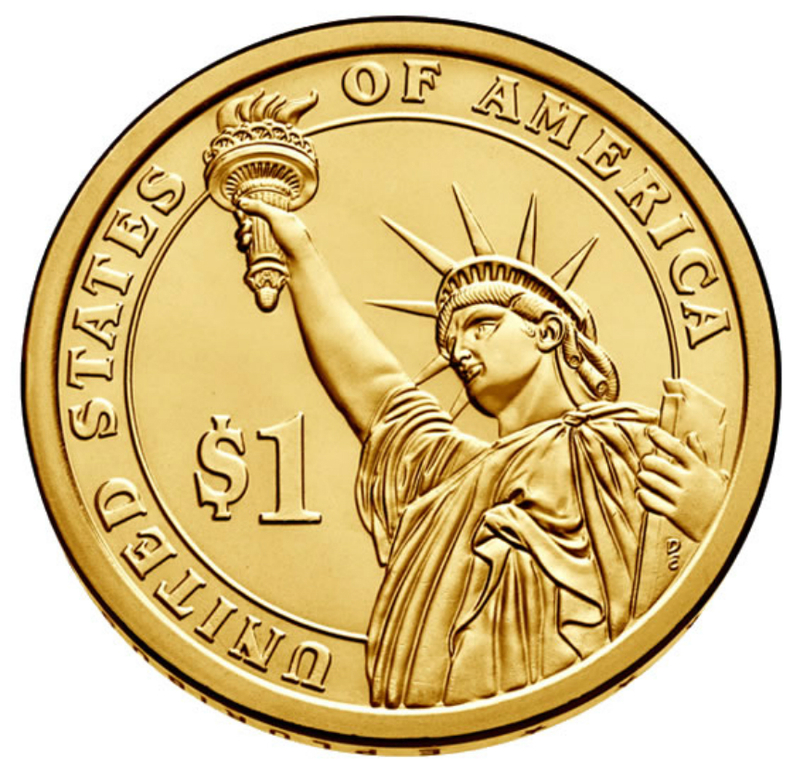 This coin represented the final release of the year and the twelfth release overall for the Presidential Dollars series. 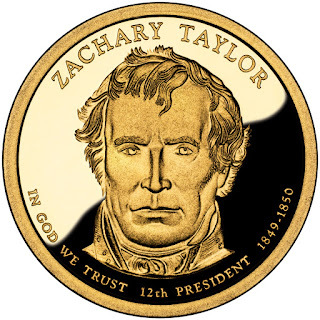 After a long army career during which he served in many remote outposts and led forces to victory in the Mexican-American War, Zachary Taylor. He only served 16 months in office before he became ill and died. He was the second President to die in office, the first being William Henry Harrison. An official launch ceremony for the Zachary Taylor Presidential Dollar was held on November 24, 2009 in Orange, Virginia. This date coincided with the 22th anniversary of the former President’s birth. US Mint Deputy Director Andrew Brunhart and a descendant of Zachary Taylor took part in a ceremonial coin pour. The 392nd Army Band performed music written for Taylor during the 1840’s. The reverse of the coin features a rendition of the Statue of Liberty also designed and sculpted by Don Everhart. This design has been used throughout the Presidential Dollar series. 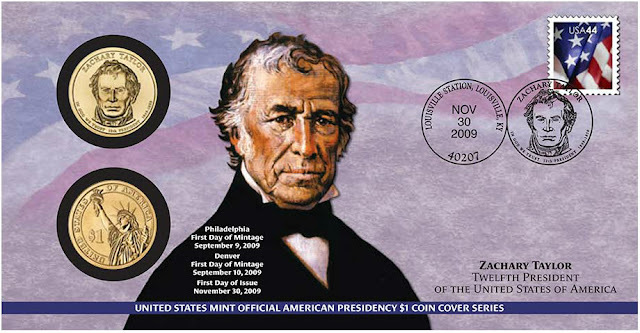 The overall mintage for the Zachary Taylor Presidential Dollar set another fresh low for the series. The circulation mintage of 78,260,000 was nearly 10 million coins lower than the mintage for the prior release. By this point in time, the US Mint had struck more than 1.75 billion Presidential Dollars. Circulation of the coins within everyday commerce remained limited and many of the coins resided in Federal Reserve Bank vaults. 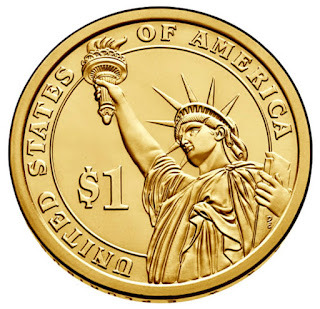 Despite the stockpile, the Federal Reserve banks were legally required to continue ordering the coins, which prompted the US Mint to continue striking them in high numbers. Taylor's status as a national hero as a result of his victories in the Mexican-American War won him election to the White House despite his vague political beliefs. His top priority as president was preserving the Union, but he died seventeen months into his term, before making any progress on the status of slavery, which had been inflaming tensions in Congress. Taylor was born into a prominent family of planters who migrated westward from Virginia to Kentucky in his youth. He was commissioned as an officer in the U.S. Army in 1808 and made a name for himself as a captain in the War of 1812. He climbed the ranks establishing military forts along the Mississippi River and entered the Black Hawk War as a colonel in 1832. His success in the Second Seminole War attracted national attention and earned him the nickname "Old Rough and Ready". In 1845, as the annexation of Texas was underway, President James K. Polk dispatched Taylor to the Rio Grande area in anticipation of a potential battle with Mexico over the disputed Texas–Mexico border. The Mexican–American War broke out in May 1846, and Taylor led American troops to victory in a series of battles culminating in the Battle of Palo Alto and the Battle of Monterrey. He became a national hero, and political clubs sprang up to draw him into the upcoming 1848 presidential election. The Whig Party convinced the reluctant Taylor to lead their ticket, despite his unclear platform and lack of interest in politics. He won the election alongside former U.S. Representative Millard Fillmore of New York, defeating Democratic candidates Lewis Cass and William Orlando Butler. As president, Taylor kept his distance from Congress and his cabinet, even as partisan tensions threatened to divide the Union. Debate over the slave status of the large territories claimed in the war led to threats of secession from Southerners. Despite being a Southerner and a slaveholder himself, Taylor did not push for the expansion of slavery. To avoid the question, he urged settlers in New Mexico and California to bypass the territorial stage and draft constitutions for statehood, setting the stage for the Compromise of 1850. Taylor died suddenly of a stomach-related illness in July 1850, ensuring he would have little impact on the sectional divide that led to civil war a decade later.